Workforce Unlimited Premier Division (KO 2.30pm): Pointon v Leverton SFC (D. Lovell), Spilsby Town v Ruskington Rvrs (R. Holland), Wyberton Res v Swineshead Inst (T. Sharrock). 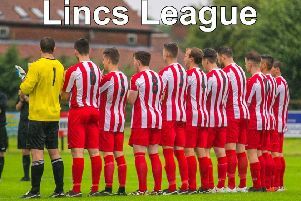 Workforce Unlimited Division One: Friskney v Kirton Town (P. Hindle), JFC Boston Seniors v Woodhall Spa Utd (R. Shortland), Old Dons v Skegness Utd (R. Dungworth), Swineshead Res v Freiston (M. Webster). Workforce Unlimited Division Two: Boston International v Caythorpe (C. Varty), Holbeach Bank v Colsterworth Sports & Social (M. Bruntlett). Workforce Unlimited Division Three: Leverton Res v Mareham Utd (T. Page), Northgate Olympic v Woodhall Res (R. Larcombe), Skegness Town A v Benington Res (M. Winwright).